I got my hair done! There is no better felling than fresh cut and color! I am so lucky to have my little sister to do my hair! She is the best! So I filmed a hair tutorial, but I have no idea what I am doing so I am still trying to figure out how to edit it and upload it! There are not enough hours in the day! But I promise I am trying to get it up! I am so in love with these Sera tops from J.Crew. I got it in 3 different colors and for those who follow me on Instagram, I am sure you know that I wear them all of the time! I also love the J.Crew toothpick jeans! They fit me really well and they come in so many fun colors. 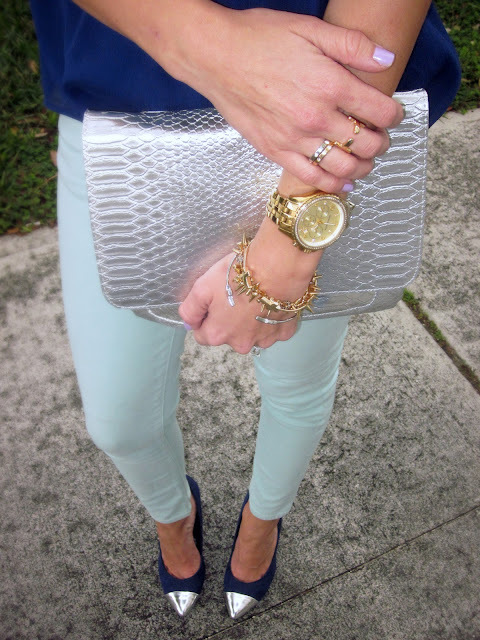 Mint and navy is always one of my go to color combos! Love your entire outfit!! Gorgeous! Love the navy with the lighter blue- so pretty! I have these Target shoes and love them to pieces! Your new hair is stunning and I love the color combo Jade. Happy weekend! omg i love this outfit with all the metallic elements in it! they make great compliments to the blue shades in your outfit! The contrast of the two shades of blue is so interesting and really pops!